After almost 40 years of teaching public administration at Ball State University, these observations and insights focusing on the challenges of teaching federalism, personnel, budgets and regulations come to mind. I arrived in Muncie from the University of Marlyand, College Park, in 1976. I will retire from the Department of Political Science, Ball State University, on July 1, 2016. My parting learning/teaching/awareness/consciousness/student thoughts are directed specifically to students but are applicable to anyone at any stage of life. Follow directions, read widely, adhere to effective knowledge routines, understand language and follow road signs of life. Do basics well, be an old-fashioned fact checker and follow the deductive with ample inductions. Maximize your energy. As my mother said regarding being a teenager, get off your backside and do something. Get going. Constructive moments lift you out of your depressions and doldrums. Action moves human lethargy and morass. Achievements bring on the chemistry of sustainability and energy realized realizes more energies. Directly engage institutions, ideas and people. Cooperation with others likely achieves common goals and individuals and the community benefit as a result. Society then is redeveloped and all boats rise. Find ways to blend the informal within the contours of formal structures and question any monopoly of organizational purpose with individual motives. Act on the premises of free speech. In times of lethargy and morass, become an institutional grinder. Grind out notions of knowledge charisma. Grinders do basics fundamentals routinely well and often. Remember that half of life is just showing up. Develop a modus operandi of a 1-10 decision-making range, not a 0-1 lose-win ossified status quo. Opportunities exist in the Internet society. You must find them 24/7 year-round. Seek out challenges of sustainability and long-lasting substance that overlay institutions, ideas and people. Create personal passions and chase after them. 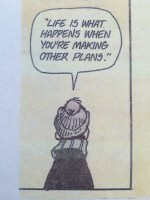 The Opus philosophy method soon emerges: life is what happens when you’re making other plans. Observe and question culture. Pay attention to how people interact through informal and formal relationships. Take note of unconscious behaviors. Culture liberates and binds. Develop insights into the obvious. Living life alone is often a dead-end. You have to trust somebody. Think. Tell the truth; don’t cheat. Truth-telling meets the criteria of both principle and principal. It’s better to fail than cheat. Professional life is full of failures. The important part is getting up to toil, to create, to rise again. It’s pragmatic not to cheat. Cheating diminishes the hard work of others. Truth-telling builds character.